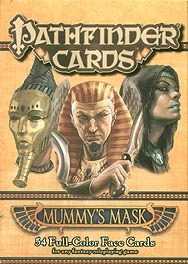 Bring your NPCs to life with the Mummy's Mask Face Cards! More than 50 key characters fill this gorgeously illustrated deck designed for use with the Mummy's Mask Adventure Path, but suitable for any fantasy game. Each card includes the character's name and role, space to record key details, and artwork by Paizo's finest illustrators. These Face Cards bring the most prominent cast members of this epic Adventure Path to your tabletop and let your players look into the faces of the enemy!